Get inside access to all parts of Madrid’s Royal Palace and Gardens, including the throne room; marvel at the artwork of Goya and Velazquez and enjoy a local’s guided tour of the stunning El Retiro Park. Madrid’s Royal Palace must be seen to be believed. This Royal Palace Tour will give you a detailed, all-access visit with an expert professional guide, to make sure you miss nothing of this spectacular building. Visit the Throne Room, the Hall of Mirrors, the Banquet Hall and the private Royal Apartments, seeing a stunning array of tapestries, ceramics, old watches, swords and army and famous artworks by grand masters such as Goya and Velázquez. 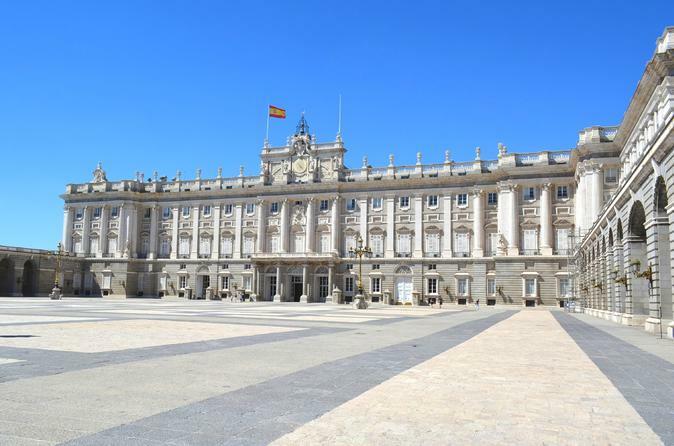 Learn how the Spanish Royal Family have lived throughout history and how they live today – seeing in the different of the building how Spain’s turbulent history and rise and fall of empire have had a profound effect on the lives of its Royal Family. You will even have the chance to explore the Palace’s 19th century English Gardens, which include two extraordinary neo-classical fountains and some incredible flower arrangements. Following the tour of the Royal Palace, you will then walk through the city to Madrid´s stunning central city park, El Retiro – a favourite spot for locals and visitors alike to walk, run, visit historic monuments, see exhibitions, relax with friends or simply enjoy their lunch. Here your tour will finish, leaving you with the opportunity to relax on the grass, enjoy an ice cream or even rent a row boat and explore the park’s famous lake.